Planet of the Apes..it is possible. "it'd s msdhouse... a madhouse." just out of curiousity, what kind of sunday paper are you getting? 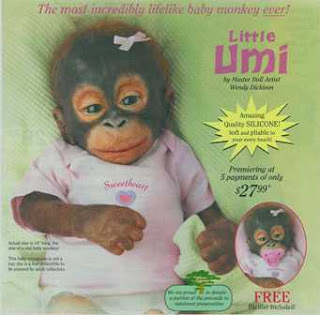 "The most incredibly lifelike baby monkey ever!" 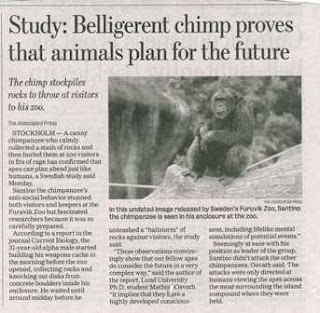 I have to agree - lately when planning for the future I too feel belligerent. A cache of weapons you say? Tempting . . .
Give Santino credit. In these times he's actually able to "SAVE" something, even if it is rocks. I know a few banks and corporations that could use someone like him to run them.